Rooting your android devices offers many benefits and comes highly recommended for enabling custom hacks and tweaks, Google Android 2.3.3 does not support non-english UTF-8 scripts like Devanagari by default but luckily if you rooted your device we can simply hack the operating-system to install custom fonts and enable display of languages like Hindi in default system applications. Posted below are the download links and step-by-step instructions how to enable Hindi display support on Google Android 2.3.3. For this hack to work you must have a rooted android device, if not, follow Android rooting guides for your device at - http://www.megaleecher.net/taxonomy/term/11019. Download and save these hindi font files to your device - DroidHindi.ttf and DroidSansFallback.ttf. Now copy these two font files to /system/fonts/ on your android device using root file-explorer, replace any file if asked for. Reboot your android device and now Hindi font display should be working as expected on native browser and other native applications. what do the letters and #s mean in this? 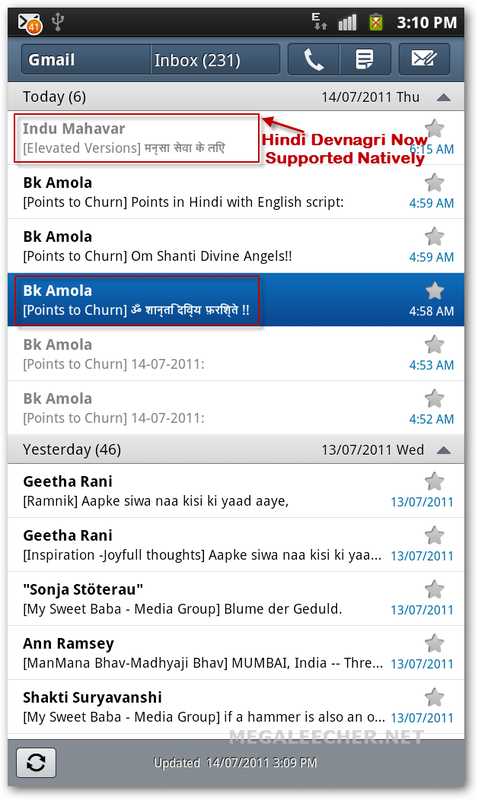 Any one know how or can help to add Gujarati & Hindi fonts on Gingerbread or Android 2.3.3 . I have galaxy s2 and not able to read mails of above languages. Instructions are provided above for Hindi font support, you can also activate Gujarati font support just by replacing/adding Gujarati font. I have paste this font but a error acure the font not copied. How to remove this attribute? Om Shanti,Thank You for this wonderful article,I am associated with Brahma Kumaris and i also receive similar mails in hindi as given in the picture.I have searched many other ways but ultimately i had to root my android phone and add font as shown in this article. App kaha located hein ? After I did this hack, yes the hindi/devanagari scripts show fine but the chinese/korean/japanese characters do not show anymore from websites like http://jp.msn.com or in apps with any east-asian characters. I need the android stock DroidSansFallback.ttf again. Hello friend.. the android font file you needed is available on below provided weblink. I was having this file so i updated on this online document transferring website. This link would work only for next 7 days from now. So you shall have to download this file before same. Chao.. Does rooting and replacing the font files, completely change the display which is normally in English ? Or does it enable us to toggle from English to Hindi for typing only ? I don't want to lose the English menu. It only enables you to view content in Hindi written in Devanagari script. This would not change the English user interface display. Please advise me what to do to read hindi font in micromax a84 android version 2.3.6. I am not able to coppy DroidHindi.ttf and DroidSansFallback.ttf to system/font folder. I have ES file Explorer. Whenever I tried to copy these file message shows "copy task failed". when i Am coping font file to System/font. an error saying access denied this folder is read only. I m not getting /system/font. When I copy font in system/font it shows operation failed. How to install my sumsung galaxy a7 in hindi font kruti dev 10...? Use fx file explorer with root add on .open system root folder. Also open lock change read write setting.because this folder is read only.chang e it write permission. Then open copy paste tnen make read only. Lock system remove permission.then see it open or not.